How do you get top ranking in a Google Search? a while / awhile: “A while” is a noun phrase; awhile is an adverb. amend / emend: To amend is to change; to emend is to correct. amount / number: Amount refers to a mass (“The amount saved is considerable”); number refers to a quantity (“The number of dollars saved is considerable”). View more on the DailyWritingTips website. Typically used to act as a comma or parenthesis to separate phrases—or even just a word—in a sentence for various reasons (i.e. an appositive). School is based on the three R’s—reading, writing, and ’rithemtic. Against all odds, Pete—the unluckiest man alive—won the lottery. Used to connect values in a range or that are related. A good rule is to use it when you're expressing a "to" relationship. Used to join words in a compound construction, or separate syllables of a word. 4 − 2 = 2. The Elements of Typographic Style recommends the spaced en dash – like so – and argues that the length and visual magnitude of an em dash "belongs to the padded and corseted aesthetic of Victorian typography." In the United Kingdom, the spaced en dash is the house style for certain major publishers, including the Penguin Group, the Cambridge University Press, and Routledge. But this convention is not universal. The Oxford Guide to Style (2002, section 5.10.10) acknowledges that the spaced en dash is used by "other British publishers", but states that the Oxford University Press—like "most US publishers"—uses the unspaced em dash. On yesterday's MacBreak Weekly show on the TWiT network, Andy Ihnatko announced Hemmingway as his app of the week. BRILLIANT! I'll never write again without it. 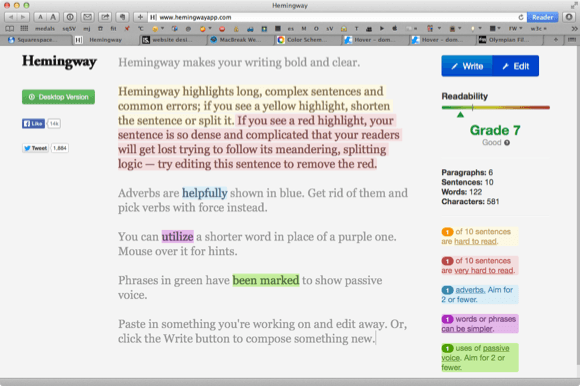 Hemingway is a fantastic app for writing that helps you write more clearly. It offers a number of features beyond your standard word processor, including highlighting long and complex sentences, giving you a readability level indicator, highlights adverbs, and gives you hints on simplifying your writing and avoiding passive voice.